With the failure and recall of the Galaxy Note 7, Samsung is down, but definitely not out. Instead of sitting in the corner licking its wounds and despairing of its dwindling stock price, Samsung is coming out swinging in early 2017 with the next version of its flagship smartphone – the Galaxy S8. Is it worth waiting for? And is it a product that will erase the ignominious departure of the Galaxy Note 7 and rebuild the reputation and trust that consumers have in the Samsung brand? Well, let’s find out. Samsung is no longer manufacturing the Note 7, and is telling users to keep their phones turned off, so many loyal Samsung customers will no doubt be keen to pick up the Galaxy S8 next year, probably around February/March. And despite the Galaxy S8 still being in pre-production, we can sift through the research and the rumours and make educated guesses on what sort of processors and technology will most likely comprise Samsung’s next (redemptive?) offering. Speculation abounds that the Galaxy S8 will be the first mobile device from Samsung to feature 4K resolution technology. This ultra-high definition visual technology is becoming increasingly mainstream, with a significant number of televisions now being sold with 4K compatible panels. According to some reports, the Galaxy S8 will feature either an 5.1-inch display with a QHD resolution, or a 5.5-inch display with a 4K resolution. It’s safe to say that we’re rooting for the 4k display. The Galaxy S7 runs on one of two chips: a Snapdragon 820, built by Qualcomm, or an Exynos 8890, built by Samsung’s own semiconductor division. Our money is on the likeliest scenario that the Galaxy S8 will use both Samsung and Qualcomm chips once again. For battery power, we’re guessing a 4000mAh battery capacity. We’re also expecting features such as Gorilla Glass 5, fingerprint sensor, force touch screen, and 64/128 GB storage with 6GB RAM. Click on the link to read the full list of expected specs of the Galaxy S8. The Galaxy S7 has one of the most innovative and impressive phone cameras on the market, even better than the well-received and very popular Galaxy S6. And there’s nothing to say the Galaxy S8 won’t continue that trend. In addition, there’s speculation that Samsung plans to mimic the iPhone 7 Plus, and add a dual-camera module with a telephoto zoom lens. Dual-lens cameras are the future, so we’d be very surprised if Samsung didn’t follow Apple’s example. Ok, now this is a long shot, but it’s a rumour that’s just too good to ignore. Samsung has announced that they will be releasing a foldable phone in the year 2017, and though unconfirmed, it’s being speculated that the Galaxy S8 will have two joined displays that can be folded at the middle. Here are some prototype pics of a foldable smartphone screen. 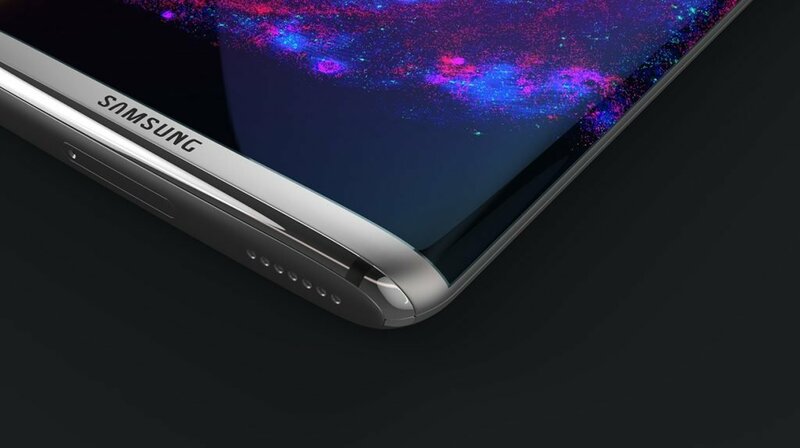 If not the Galaxy S8, then maybe the Galaxy S8 Edge or the Galaxy X will boast a folded screen. Rumours are vague on whether the Galaxy S8 will be waterproof. We hope so, because we believe that waterproofing is a feature consumers should expect from new smartphones. The price tag for the Galaxy S8 isn’t set yet, but we estimate it’ll be around the $850 mark. That’s it for now, dear readers. For all the latest news, keep reading the Repair Express blog. Fix My Touch is your go-to for mobile device repair. Screen replacements, water damage, and the unlocking and customization of smartphones, tablets, and touch screen devices are our specialities, and our repair warranties are the best in the business. If anyone can fix your mobile device, it’s us. Contact Repair Express for cell repair in Vernon, West Kelowna, and Penticton.